The holiday home Adria is located at the end of a cul-de-sac directly on the sea adjacent to a small bay. On the coast of the Velebit Canal, away from mass tourism, on the outskirts of Karlobag is the holiday home Adria directly on the sea. The beauty of Croatia will make you forget your everyday life quickly. Because of its large number of islands and bays, this coastal strip is a little paradise especially for divers and holidaymakers with boats. The holiday house Adria consists of two apartments for 2 to 6 people each with generously designed terraces, air conditioning / heating, dishwasher and flat screen TV with satellite connection. Each apartment has a kitchenette with dishwasher, refrigerator, dishes, glasses, etc., as well as a large terrace with stunning sea views, where you can relax and recover from everyday life. Each apartment has air conditioning. In the garden of the house there is a barbecue and an outdoor shower. On the beach in front of the house, chairs and umbrellas are available for a small fee. The registered here Top 2 is located on the 2nd floor of the house can accommodate 4 to 6 people. The apartment has a fully equipped kitchenette with dishwasher, two bedrooms each for 2 persons and wardrobe, as well as living room with sofa bed for 2 persons. SAT-TV is available. The bathroom has a shower. 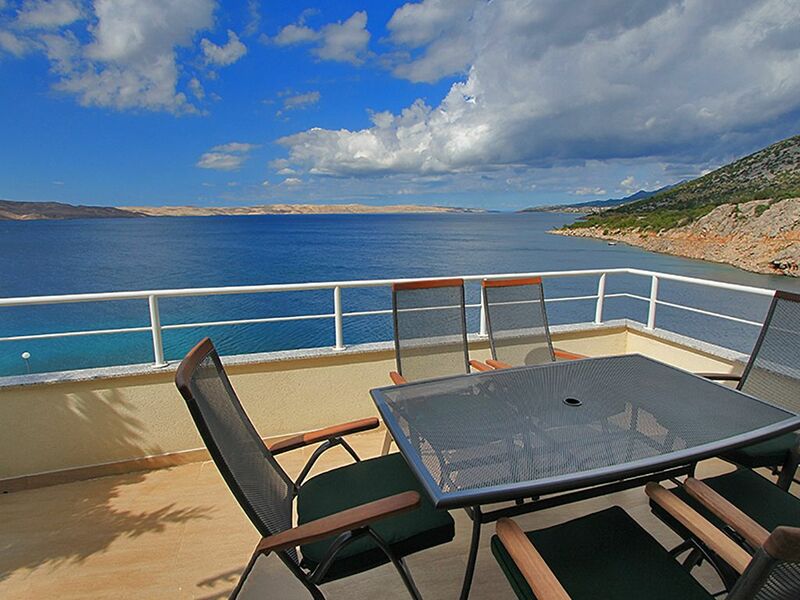 From the terrace or Balcony of the apartment you have a wonderful view of the sea and the island of Pag. In the garden of the house you have a large, stone barbecue and invites you to social evenings on the sea. About 250 meters from the house is a beautiful gravel bay with a beach cafe. In the 1. Upstairs is still the apartment Top 1. Air conditioning is not included in the price - will be charged locally on use EUR 5.-/Day The private bathing area directly in front of the holiday house with the character of a private beach can be reached from the garden About 250 meters from the house you will find a beautiful gravel bay with the Cafe Tatinja. On the beach in front of the house, chairs and umbrellas are available for a fee The center of Karlobag is 500 meters from the house. In Karlobag you will find several cozy little cafes in dreamy, typically Mediterranean lanes or restaurants where you can enjoy the Croatian cuisine ..
Wir hatten bereits im Vorfeld Fotos der Ferienwohnung angeschaut und einen positiven Ersteindruck bekommen. Die Angaben im Online-Inserat stimmten vollends überein mit den Begebenheiten vor Ort. Es war alles top in Ordnung, sauber, gepflegt und wir fühlten uns gleich sehr wohl. Die Verständigung mit dem Vermieter fand in englisch statt. Er und seine Frau waren sehr gastfreundlich und hilfsbereit. Für uns waren es wunderschöne und erholsame 14 Tage! Wir würden dieses Feriendomizil auf jeden Fall weiterempfehlen und auch selbst wieder buchen. Hier handelt es sich um eine wunderbare Ferienwohnung mit einer Top - Ausstattung und sehr netten Vermietern. Es mangelt an nichts! Spend your holiday in Croatia away from mass tourism in the Kvarner bay right on the beach with the clearest and cleanest water of the Adriatic. The bathing place, which belongs only to the house, can be reached from the garden. Beach chairs and umbrellas are available at the bathing place.